This is the best back-packable mattress pad I have used. The Stratus is aptly named. I bought this mattress for a sailing/camping event along the Maine Island Trail in a small boat. The pad has proved to be just right for camping on land as well. 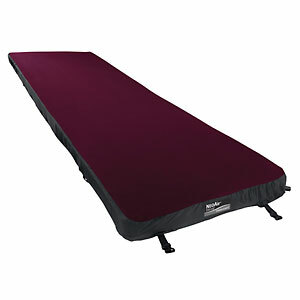 The outside ribs help prevent rolling off, which always happens to me on other sleeping pads I've used. This one provides a nice cradle effect and even on the boat I did not slide off. I find it easy to inflate and deflate, a welcome change compared to the larger car-camping models. Also, it packs up smaller and easier than the Therma-Rest type. It is arguably worth the high comfort factor at about 1 1/2 lbs. I am 6'3" and many of the other mattresses are too short. The Stratus comes with several choices with both wide and long as well as regular size options. As with any air mattress used in cold conditions you may need an added insulator especially if your sleeping bag compresses as down bags do. Its rated r-value is 2.9. I've found the fabric cover to be sufficient and durable in conditions I've found so far. Thanks for the review, Steve. I hope the Maine Island Trail trip was great (I'm also in Maine). Purchased in 2013. Has held up well over four years with a lot of usage. Long option fits a 6'3" person well. Pretty easy to inflate and comfortable. Packs up decent after getting used to it. Pretty heavy as they go, but for the money, very solid. 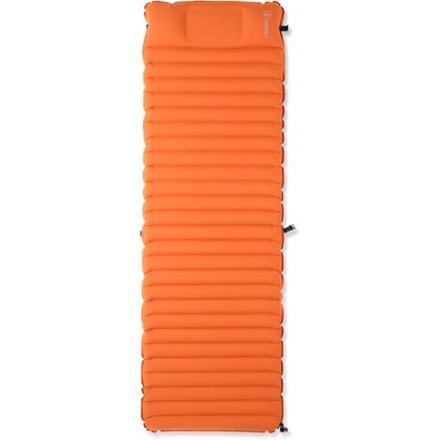 Good backpacking air mattress, you won't roll off it at night, not the lightest out there. REI used to have an excellent lifetime warranty, but this was the last REI branded item I purchased as the staff is now rude and doesn't honor returns on defective items beyond a couple of months. Nice green color, sturdy construction, larger outside air channels to prevent you from rolling off in the night, very user friendly air nozzle. The material is quiet compared to Thermarest which makes crinkle noise that wakes me up whenever I turn over. This mattress has given me the best sleep so far. No need to take a separate closed cell foam pad. It is relatively heavy but it makes up in comfort and assurance that you won't wake up on the cold ground with a deflated pad. I've had this mattress for 16 months and gone on several backpacking and camping trips. I choose this to sleep on even when car camping. I have used in below freezing weather and on hot summer nights. I took it on backpacking trip to the Zion Narrows. Slept like a baby. I really like this pad, but wish it had a slightly higher R value. I took it out for the first time in January as I received it as a Christmas present and the temperature got down into the low 30s. I was using a 32 degree Mountain Hardwear bag with a liner and ended up with a couple of cold spots. Since I was doing some testing for a first run I luckily brought my 0 degree Mountain Hardwear bag also and was warm once I switched bags. I did get a really comfortable night's sleep. I generally use a Therm-a-Rest BaseCamp self-inflating mat, since I do mostly car camping, but this mat was much more comfortable. The fabric is rugged and I look forward to many good years of use.